WhyDidTheChickenCrossTheRoad.com, first hatched in 2000, as a fun outlet for owner Paul Goldstone, DomainIt.com. 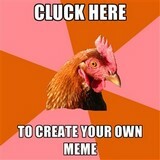 The goal of the site is simple -- to answer that age old question of "why did the chicken cross the road?". You may think the answer is simple -- "To get to the other side" of course! However, WhyDidTheChickenCrossTheRoad.com offers hundreds of hilarious and egg-citing answers in more than 10 different categories. Over the years, WhyDidTheChickenCrossTheRoad.com the site has continued to egg-spand, now offering lots more poultry fun including chicken sounds, chicken games, silly images, and more. We love interacting with our visitors, so feel free to offer suggestions, leave a comment, or even submit a joke!